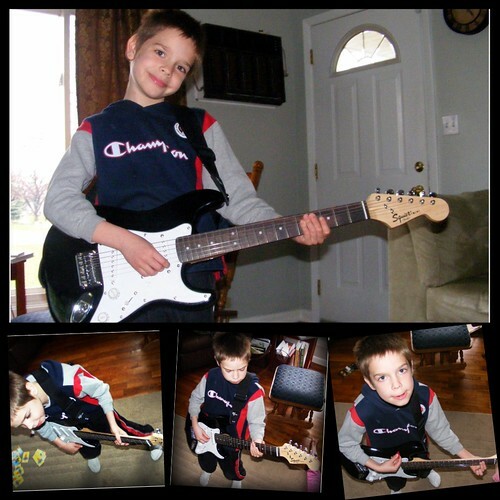 Josiah received his birthday present a little early this year - his first guitar! He's so excited! He can already play a couple chords (he hadn't learned them yet when I took these pictures - so for all you guitar experts - he's just messing around here). Mom is just hoping he learns how to use the volume control on the amp! I have a son interested in guitar. Does Josiah take lessons from a person, or do you have a good DVD curriculum to recommend? Looking good Jo. You can come rock out our house anytime!!! Nice guitar, Jo!! Can't wait to hear you play!